These cuffs can be worked up in a variety of sizes and each size does offer some stretch to it. I've written this pattern for three sizes - small, medium and large. 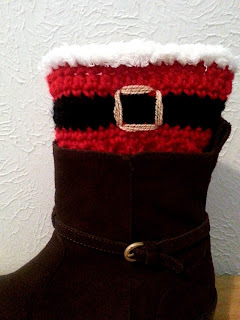 If you're unsure of what size to make, measure around your calf where your boot cuffs will sit. To change sizes, increase or decrease the number of rows made until your beginning strip of rows can wrap around your leg. Pattern is written for small size, with larger sizes in parenthesis. Beginning chain does not count as a stitch. Begin each round in the same stitch as your join. For the white fur trim, you will work with 1 strand of white and 1 strand of Pipsqueak. Join the white yarns in any stitch along the top of your cuff. Ch. 1 and sc around. Join to the first stitch and fasten off. For the buckle, take a long strand of Vanna's Glamour (about 12 inches). You will work in the black stripe along front of the cuff. Using your tapestry needle, make a few stitches (I did 4) between rounds 3 and 5. Repeat across 3 or 4 stitches for the top of the buckle. Make a few stitches between rounds 3 and 5 for the other side of the buckle and repeat across 3 or 4 stitches for the bottom of the buckle. I hope you enjoy these cuffs as much as I do. Happy hooking! These are so cute and easy to make! Thanks for the great pattern. I want to make one for me! In winter I always wear boot cuffs because I'm very slim and boots are always too big, so I need cuffs! I love this pattern! Made many pairs. 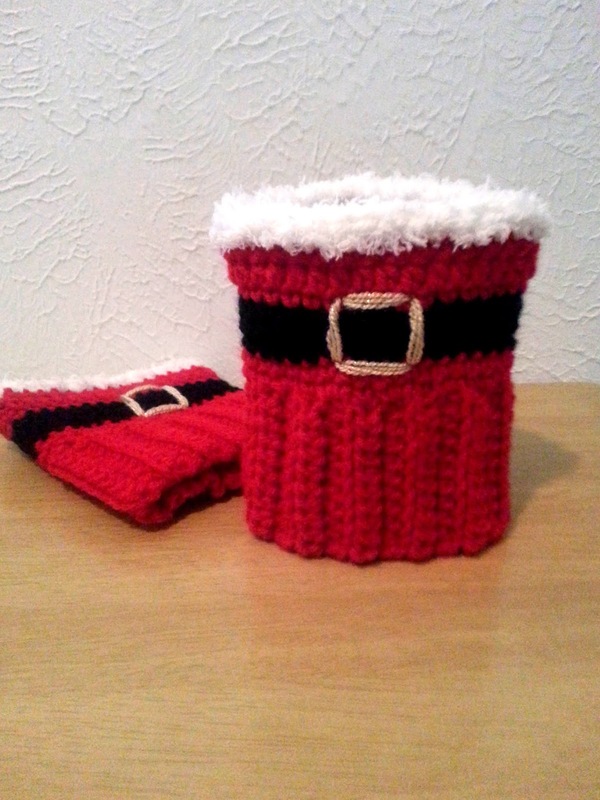 Also I am thinking of changing colors and making some snowman ones! 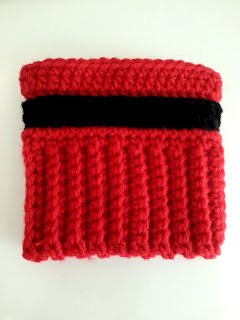 Great tip about crocheting around the front post when changing colors. It really does make a much better line. I'll use that for many projects. Thank you! What a wonderful pattern! The instructions are very concise, clear and easy to follow. These came together very quickly, and my daughter, for whom I made them, squealed with delight when she saw them. Loving the pattern and easy flow. One question, after the row of Fpdc with the black, where does the hdc in round 4 go? I tried it behind the Fpdc into thebted sc from previous round but it makes the red show. So do they go around the Fpdc?? Thanks in advance for your answer. Hi! In round 4, you work each hdc in the top of the post stitches just as a regular stitch. I hop that makes sense.